Weibo user 爆料人小明 uploaded a small image from a magazine (probably of the latest Figure King), revealing two new Takara Tomy products: Movie The Best MB-EX Age Of Extinction Bumblebee & SS-EX Drift With Mini-Dinobots. The Movie The Best line was a line of Japanese exclusives movie-accurate redecos and retools of previously released movie figures. After 20 releases and one Wonderfest exclusive, most of us would have thought this line was completed and its place taken over by the Studio Series line. To our surprise, this 2019 we are getting another Movie The Best release: MB-EX Arm Gun Bumblebee. This is a minor redeco of the Age of Extinction Bumblebee figure, and includes a new movie-accurate gun which can be attached to the arms or the side doors in car mode. 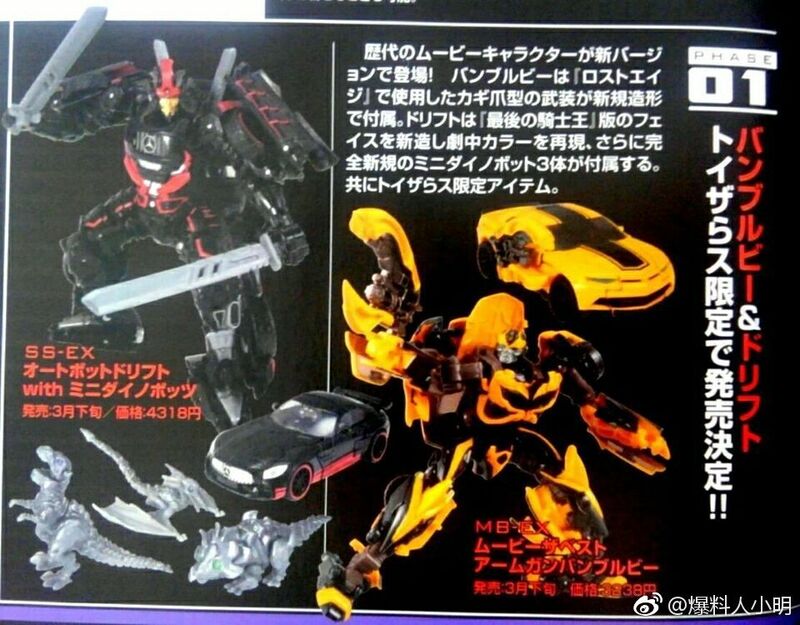 Additionally, we have the announcement of the Studio Series SS-EX Drift with Mini-Dinobots. This pack seems identical to its Hasbro Studio Series counterpart we had previously seen. According to a post from Autobase Aichi, these figures will be ToysRUs Japan exclusives both expected for release late in March, 2019. MB-EX Bumblebee is priced 3238 Yen ($29.55 approximately) and SS-EX Drift is 4318 Yen ($39.40 approximately). Check out the image attached to this news post and sound off on the 2005 Boards!